Andrea Solario was the brother of the sculptor Cristoforo Solario, known by the nickname Il Gobbo (the Hunchback), accompanying him to Venice around 1490 and returning from there to Milan in 1495. In 1507 the artist was summoned by the Cardinal d’Ambroise to decorate a chapel in his châteaux in Gaillon, seat of the episcopate of Normandy. Solario returned to Milan in 1509, possibly travelling to Rome around 1514. Andrea Solario’s oeuvre and his artistic personality were defined in a series of studies from the 19th century onwards. In the 20th century various monographs on the artist attempted to catalogue his oeuvre more precisely as many of Solario’s paintings had been incorrectly attributed to other painters of his circle. His compositions reveal the influence of painters such as Antonello da Messina and Leonardo da Vinci, as well as that of Flemish artists, in particular those whose works he could have known in Italian and French collections. The present Portrait of a young Man was in the collection of Lord Leconfield in Petworth Park, entering the Rohoncz collection in 1928 via the Paul Cassirer gallery. The panel is recorded in the catalogues of the collection at the Villa Favorita from 1930 onwards, the year when it was included in the exhibition at the Neue Pinakothek, Munich. In 1854 the painting had been published by Waagen as a work of the school of Giovanni Bellini, an attribution rejected by Berenson who considered it an early work by Andrea Solario. Rudolph Heinemann was in agreement in his catalogue of the Collection of 1969, as were Borghero and Watteville. 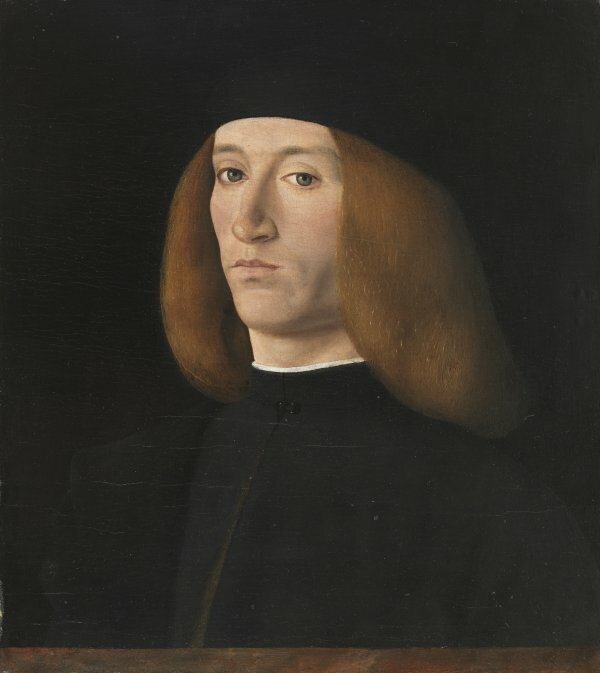 Suida, however, attributed it to Giovanni Bellini when he wrote his commentary on the Italian paintings in the Rohoncz collection following their presentation in Munich in 1930. The typology of this portrait is based on a model developed by Antonello da Messina that was widely used in Venetian circles. The young man, presented against a very dark background that almost fuses with his clothing and hat, emerges strongly through the light that falls from the left onto his face. Presented bust-length and three-quarters, he is located behind a narrow parapet that functions to create a sense of depth in the foreground. The features of his face are crisply defined, particularly the form of the nose and mouth and the compressed lips. These lips, together with the gaze, are used by the artist to convey the nature of the sitter’s personality. David Alan Brown tentatively attributed this panel to Antonio Solario (active 1502–14). Brown considered that the treatment of the flesh, the young man’s expression and the echoes of Bellini in the head were not typical of Andrea Solario. According to Brown, these features conform to the style of Antonio Solario.